Pause for a moment; take a deep breath. Close your eyes. Picture this: you made your firm over $12 million today through a series of brilliant, high-stakes trades. All that stress might not be good for the heart — but you’ve got the fix: an evening of back roads in your Roller, top down. Okay, now open your eyes. Perhaps you’re not an oil magnate, maybe you’re not sitting atop a multibillion-dollar hedge fund, and it’s entirely possible that you’re not a professional athlete. 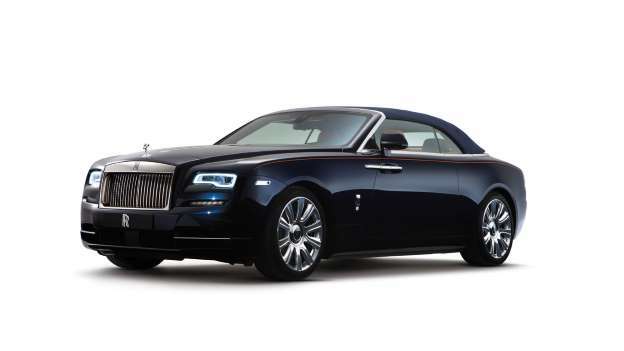 But someday, if you play your cards right, you might be in a position to own Rolls-Royce’s latest model. This is the Dawn, a four-place convertible based on the Ghost and Wraith — the company’s smaller, less expensive models that appeal to younger (but still extraordinarily well-off) buyers. 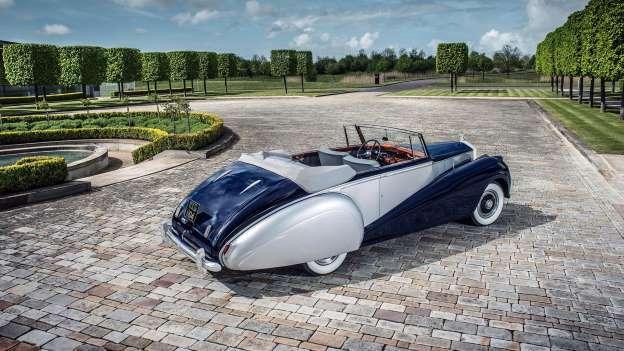 The press release describes the Dawn as “the sexiest Rolls-Royce ever built,” which might be arguable — there have been a lot of beautiful Rolls-Royces over the years — but this particular car makes its case in a screaming orange “Mandarin” interior beneath “Midnight Sapphire” bodywork. The beefy dimensions are also a contributing factor: the rear track is slightly wider than the Ghost’s, while the wheelbase is 180mm shorter. 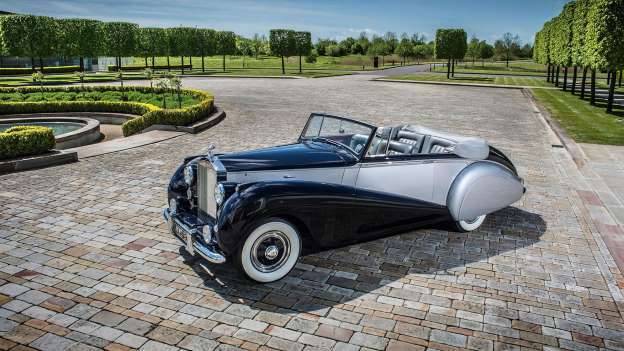 The decision to go with a soft top when retractable hard tops are all the rage seems like an odd one, but Rolls-Royce has an explanation for it: “reasons of aesthetics, romance and brand appropriateness,” the company says. 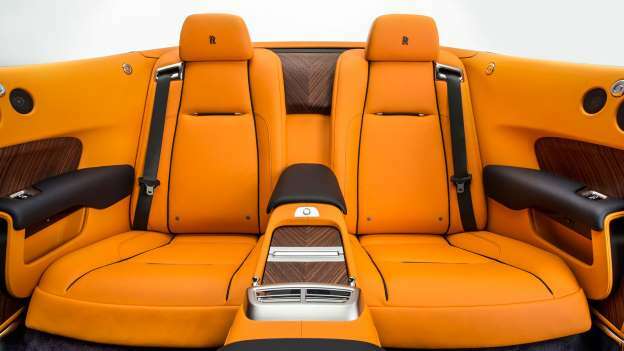 It claims that the interior is as quiet as a Wraith — a fixed-roof car — with the top up, which is pretty impressive considering that there’s only fabric and insulation separating the passengers from the elements. The mechanism can be operated “in total silence” in 22 seconds at up to 50 km/h, or about 31mph. In the cabin, the Dawn is equipped with all the accoutrements you might expect of an ultra-luxury vehicle with access to BMW’s parts bin, including a touchpad with character recognition for text entry into the navigation system (basically a really beautiful iDrive controller), heads-up display, and dynamic cruise control. 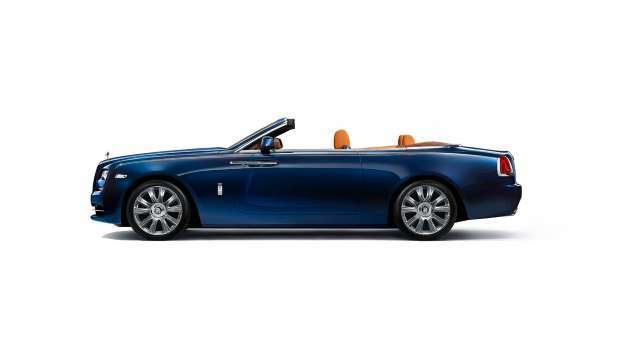 Under the hood, there’s a Rolls-Royce trademark 6.6-liter V-12 good for 563 horsepower, which is enough juice to propel this 5,644-pound beast from 0 to 62mph in 4.9 seconds. That’ll get you smoked by a Tesla Model S P90D, but at the next light, you can pull up and remind the P90D driver that you’ve got three of those things in the garage. The Dawn’s first model year is already sold out, so you can definitely expect to see a few on the road when deliveries start early next year.